The wedding bells went off majorly this year. A good number of the wedding listed below put a new meaning to "over-the-top" while some others got major buzz because they caught us off guard. Take a look. The wedding of Folarin, son of Folorunsho Alakija, the richest black woman in the world to his Iranian beauty Nazanin Jafarian Ghaissarifar daughter of business mogul Mr Khosro and Mrs Nooshin Ghaissarifar was held at the prestigious Blenheim Palace in Oxfordshire, and reportedly cost 5 Million Euros. Benin City stood still when Daniel, son of Esama of Benin Kingdom tied the knot with his sweetheart Ebike at the St. Albert Church, followed by a beautiful wedding reception planned by award-winning event planner Bisola Trendy Bee. The event is one that won't be forgotten in a long while as it was a meeting for royalties and elites in the country with the hashtag #TheIgbinedion17. Younger sister to multi-award winning media personality Toke Makinwa got married traditionally to her Norwegian fiancé Stian Fossengen on Saturday 15th of July at The Civic Center, Victoria Island, Lagos. The event which was planned by Marcus Smith events had so many Nigerian celebrities. Their white wedding was held later on in the groom's country, Norway. The media personality got us all in a lovey-dovey mood when she started her journey of 'for better, for worse' with the love of her life, Olumide Aderinokun. 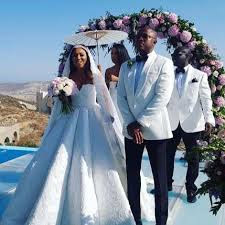 Their elaborate introduction and traditional wedding in Lagos was topped off in the Greek island of Mykonos at a lush event planned by Elizabeth Elohor. Miss World 2001 surprised everyone when she got married to Ishaya Danjuma, son of former Defence Minister and billionaire businessman, Theophilus Danjuma. The wedding was a private one which was held in Marrakesh, Morocco on Saturday 8 of April 2017. It was also planned by Elizabeth Elohor of Prive Luxury Events. Adesola Adepoju of House of Jahdara gave Nigerians something to talk about when she hired strippers to entertain guests at the after-party of their wedding and shared bundles of money as souvenirs. The fashion designer and brother to comedian AY tied the knot with his longtime sweetheart Grace Onuoha. They exchanged their vows in a beautiful garden and later proceeded to the Glitz Event Center Lekki for their very glamorous reception. The traditional wedding between Halimat Saraki, daughter of the Senate President Bukola Saraki and Adetiba Olatunde Olukanni took place at the world-class Eko hotel and suites, Victoria Island, Lagos. 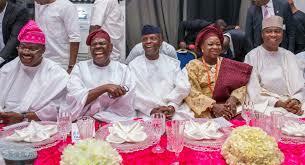 The wedding which was strictly by invitation was graced by the Vice President Yemi Osibanjo, former Commonwealth Secretary-General, Emeka Anyaoku, Senator Ben Bruce, Aliko Dangote, Asiwaju Bola Ahmed Tinubu, Udo Udoma amongst other dignitaries. The wedding 'Fatiha' later took place at the National Mosque in Abuja with a reception at Transcorp Hilton Hotel and superstar singer Davido thrilled the guests. The CEO of Sayaveth Interiors and Hotel tied the knot with her millionaire oil and gas sweetheart Kenneth Bramor at an event held at Esteem Event Center in Benin city. The wedding had lots of top government officials in attendance and there were dollars flowing all around like nothing. Guests got iPhone 7s as souvenirs and two brand new Toyota Camry cars were given to lucky winners after a raffle draw. We saw the obvious chemistry when the pair co-starred in the blockbuster, The Wedding Party. But nothing could have prepared us for the surprise that was their engagement. It felt like we were all involved in their sweet love story and, invited or not, the whole country followed their wedding tagged #BAAD2017 from the introduction to the elaborate traditional marriage at Landmark Event Centre and their breathtakingly beautiful destination wedding in Cape Town, South Africa.